Claudia’s first exposure to politics came under the influence of a local councilmember, in the midst of a heated debate over local immigration enforcement. Concerned over the observed lack of political representation, yet curious about the political process, she interned at San Jose City Hall and later served as the city’s youth commissioner- promoting policies aimed towards creating protective factors to improve the lives of youth in San Jose, California. 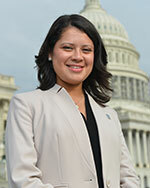 Claudia feels passionate about improving the living conditions for immigrant families, particularly women and children. She recognizes, however, that there are many issues which make the Latino community vulnerable, including health care access, political and legal representation, and financial education. Claudia feels excitement in joining the CHCI familia, and hopes that through the Public Policy Fellowship Program she can gain valuable insight into the intersection of politics and the public policy-making process.